The Jazz Agency is modern agency run by me, Dan Sheppard. 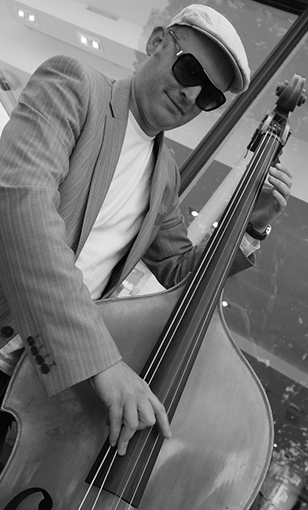 I am a professional jazz double bassist based in Brighton, UK. 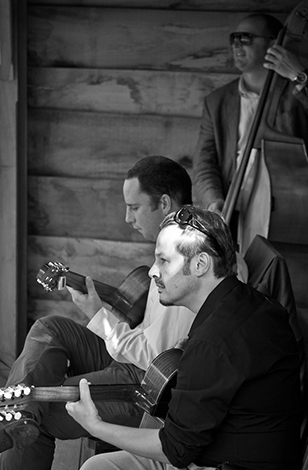 I have worked around the world with some of the top names in jazz. At the last count I have played in 37 countries and worn out 3 passports. As well as being a musician I have plenty of experience organising gigs – I successfully ran Event Music for 5 years and before that I worked as the right hand man to several band leaders. What’s different about The Jazz Agency? Increasingly in the modern age it is down to us musicians to create our own work. The Internet age is superseding all the old networks and allowing musicians to communicate directly with their customers – I think this can only be healthy. We can remove the middle-men with all their overheads and simplify the process of booking a live band considerably. How do we achieve this? Read on! Picture the old way – a potential customer would contact a music agent, who would have a physical office space and some staff. We don’t need those anymore! The agent would then contact the relevant band to see if they’re available, and wait for a reply. We already know who’s available! The client might have some questions which the agency staff can’t answer, after all they’re often temps, and know next to nothing about music. We’re musicians, we can answer these questions ourselves! The old-school agents would charge 20% on top of the fee to cover all their overheads and show some profit. 20% is the industry standard, but there are some who charge more – sometimes even way more. Where does this money come from? The client’s pocket! So you’re not only hiring a band, you’re paying the agent and all their overheads. As a result of our streamlining we keep overheads very low – we pay for the site and its hosting, we don’t need an office and we have no staff to pay. All of this results in a lower over-all fee. The musicians are happy, and the customer (that’s you!) will save money. I’ve been working as a professional jazz musician for more than twenty years. Throughout that time I’ve played most types of gigs with lots of different musicians. I know very well which ones are of a high standard, are punctual, reliable, courteous and well-presented. These are the professionals I choose to put on my site. All the bands you can see here are regular performers at such places as Ronnie Scott’s, Claridges, The Ivy, The Caprice, Anabel’s, The Dorchester, Buckingham Palace, The Army and Navy Club, The Groucho Club and many more top-level venues. Our client list is enviable – Sir Paul McCartney, Sir Terrance Conran, Paul Merton and Elvis Costello are just some of the big names that have used our jazz musicians for their private parties. Our list of corporate clients is also impressive, including William & Son, Oris, PricewaterhouseCoopers, Credite Suisse, Savills, Liberty London, The Family Law Bar Association, Mercedes Benz UK, Bentley, Guinness and many more. Update as of 6/6/17: we can now add the following names to our corporate client list: The Fine Art Group, Bang & Olufsen and Neville McCarthy. There are a few more in the pipeline as I type… exciting times here! As you can see, this agency represents some of the finest professional jazz musicians in the UK today. If you need any more convincing take a look at our testimonials, and feel free to get in touch for a no-obligation quote. If you need quick answers, a fully professional band and a reasonable price, use the professionals – call The Jazz Agency today.